Now, there are more 7,000 state legislative seats in the country, according to the National Conference of State Legislatures, which makes that 913 number slightly less eye popping. Still, the Democratic losses between 2010 and 2014 amount to 12 percent of all state legislative seats nationwide. 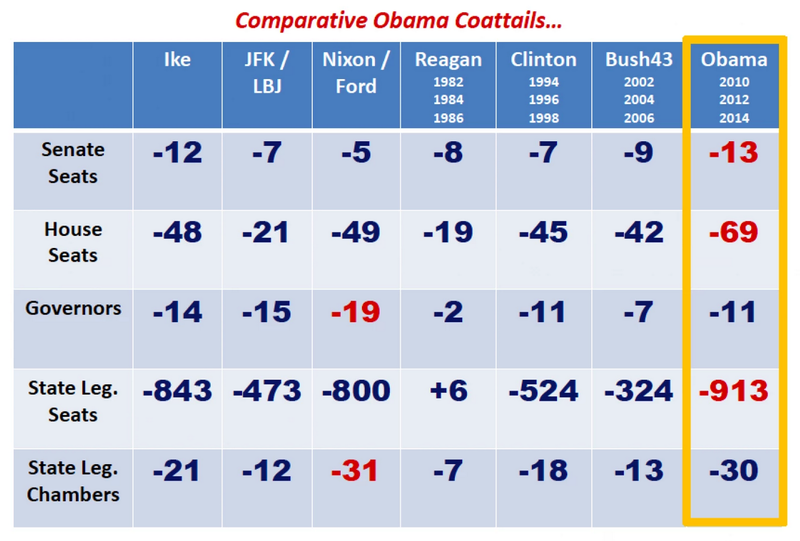 As NCSL notes, Republicans now control over 4,100 seats — their highest number since 1920. After taking over 11 legislative chambers from Democrats in 2014, Republicans now control 30 state legislatures completely — and have full control of state government (state legislature and governor) in 23 states. State legislatures are the minor leagues. Most of the politicians — Barack Obama included — who have gone on to great things, politically speaking, honed their craft in the state legislature of their home (or adopted home) state. Previous Previous post: Why Do Women Get Weepier?